My mind is like a runaway train. Thoughts hitch a ride on this runaway train and I don’t even know where it’s going. There are times when I’ve driven all the way home and thought, “Did I stop at the stop sign on 42nd street?” And I’ve also thought . . .
How come my husband isn’t holding my hand anymore? Wonder what people think of me? How come I’m not losing more weight? When negative, harmful thoughts become meditations they manifest, they become “things.” They are either in your head and create torment and misery, or, they are in your actions and create problems or both. They materialize just as God’s thoughts materialized to make heaven and earth. How do you become successful in this ever-changing world with an ever-changing mind? By living Psalms 1:2 that speaks of meditating on what God says. Your Godly thoughts lead to manifestations of kingdom experiences. 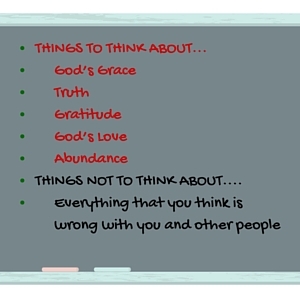 Beloved, think on these things – those things that are providing, peace, love and joy, things that are important to God, in service to man, in praise and gratitude for life, on things that are true. Think on these things for success.